Tough financial situations do not wait for your paycheck, do they? Medical emergencies, urgent home improvements, family and children's needs, pending bills and even special festive occasions can put you in trouble when you don't have money, especially when payday is far. However, to address those issues, quick and easy cash loans are not far from you with EZPayDayCash. As a direct lender, we offer easy money loans online for short terms which you get in one business day after you apply. No need to worry about your bad credit while applying for a payday loan online, because we don't believe in any credit checks. And this is not all; you have more reasons to choose us. In financial emergencies, when you need money fast, you cannot count on a conventional lender. If you apply for a personal loan, even with a good credit, it won't take any less than 30 days. Apart from that, you have to visit the office physically, go through a check of your credit history and yet, there is no guarantee of approval. Sometimes with mainstream lenders, the need of a collateral could be there. If you are someone with a bad credit status, then even before applying for a loan, you are rejected. 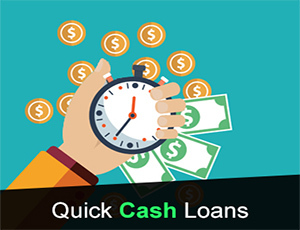 With a direct lender such as EZPayDayCash, however, you can get an easy money loan online by filling up the form even in your living room, without visiting any office. In less than 3 minutes the simple application process will be over, and you’d get an instant approval. The next business day your loan amount will be in your account. There is no third party involved, so no headache. With 24/7 accessibility and secured process, your information is safe. Similarly, there is no restriction on the nature of expenditure; you can spend the money anyway you want. Just payback on your next pay date, and if you need to extend the time, repayment term can be extended to another 30days with minimum charges. If you are an American aged 18 or above with a stable monthly income, and you have a bank account, then you wouldn’t face any financial difficulty. Because you have everything you need to get a quick loan online with instant approval. Yes, that’s all you need. Therefore, having a bad credit is not an issue at all. With direct lender such as us, you can apply for an easy loan with no credit checks. 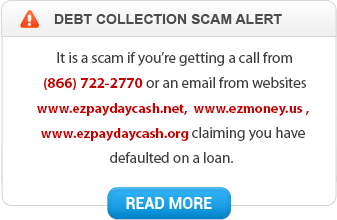 EZPayDayCash offers the most competitive rates in the market. Use our services and nothing will stop because of cash shortage until we are here. Apply for a payday loan online now.